There are two types of weekend people: weekend warriors and weekend wanderers. Warriors like to be busy, get things done, and catch up on this and that. Wanderers like to relax and figure out their plans based on what they are feeling each day. They like to see where the weekend takes them. We are weekend wanderers. What kind of weekender are you? While wandering around last weekend, we found ourselves at a local Starbucks. To our delight, we saw two very large Bernese Mountain dogs sitting out front with their two humans. Admittedly, we must say that we originally thought we saw one HUGE Berner. The way the two dogs were laying on the ground gave the illusion that there was one unbelievably big Berner. But as we got closer we realized there were two. Still large, just not shockingly large. We gave a smile to the two berners and humans as we walked into the Starbucks to get our usual grande iced coffee. Even though we are dog lovers, we don’t always introduce ourselves to every dog we see. But, on our way out of the Starbucks we couldn’t help but stop and say hello to these two Berners. They were just so beautiful! A beauty that can’t be ignored, especially when you are within petting distance from them. Being in the dog industry for so many years, we are able to identify breeds almost instantly. These two had every classic feature of a Bernese Mountain dog. Daily, we see these features on all of our Bernese Mountain Dog gifts so they are easy for us to recognize. Bernese Mountain dogs are large, but not intimidating like some large breeds. Their personalities are calming, friendly, and adorable. They move with grace but with a touch of clumsiness that is just adorable. They are majestic with their longer haired coats but they aren’t demanding like some other regal looking breeds. The German Shepherd, for example, is a very regal dog and their personalities demand acknowledgment. These two Berners gave us a friendly hello and then they went right back to their business. We spoke with their two humans for a good while. They gave us the impression that Bernese Mountain dogs are kind of like potato chips – you can’t only have one! 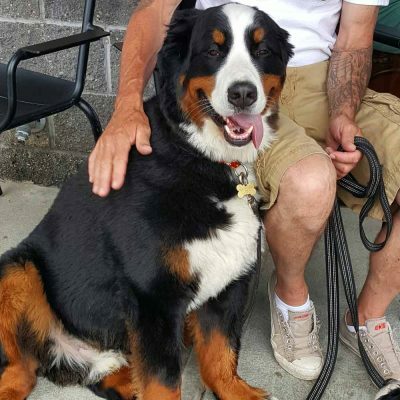 They adopted their first Berner and soon heard of a family looking to place their Berner in a new home. And then there was two! Both are loving, kind, and gentle but one likes more attention than the other. While we stood chatting with the couple we quickly learned which Berner liked to be loved on the most. Below you can take a look at the picture of the Berner who stopped chewing his bone just so he could cuddle up next to his male human. He is their little shadow at home. The other stayed occupied chewing on his bone. The couple said he is the one who usually keeps to himself. He has no issue doing his own thing, remaining calm, cool, and collected. But they can’t keep the two home by themselves for too long or else they get a little bit of separation anxiety and start crying for them. They’ve made a Sunday tradition to take the two Bernese Mountain dogs to their local Starbucks where they get treated with a grilled cheese. You hear that Starbucks? You’re loved by the four-legged community too! This is one of the reasons why we love weekend wandering. We get to meet unexpected friends, 2 legged and 4 legged! If you always end up at the beach or getting extra work done in the office you aren’t likely to meet new furry friends. Many beaches don’t allow dogs in our area and we can’t remember the last time we saw a dog in a workplace. You can always find delight in unexpected adventures! Before we headed off, we gave the two Berners a pat goodbye. While the cuddler stayed close to his human, the Berner who likes to keep to himself looked up, gave us kisses, wagged his tail, and went back to his bone. Until next time, pretty boys!